The European Union steps into 2017 burdened with huge issues – a never-ending flow of migrants, continuing euro zone woes, and tensions with Russia. Growing frustration with Brussels is threatening to challenge the status quo in the EU, and with elections coming up in key member states, alternative political forces could be one step away from power. Can the Union withstand the pressure? And when did the idea of a peaceful union of European nations become flawed? We ask the former president of the Czech Republic – Vaclav Klaus is on SophieCo. Sophie Shevardnadze: Former Czech President, Vaclav Klaus, thank you very much for being with us today. SS: Now, Europe marks the 25th anniversary since the creation of the EU. Twenty-five years on, do you see the European integration process as a success or a failure? VK: I am a very known critic of the European integration process, everyone knows it, so it will be no surprise to hear from me that I am not so happy with what has been going on, and I was very much in favor - it was still in the dark communist days - I was really in favor of the European integration process, but this process has been switched, transformed by the Maastricht treaty, 25 years ago, and especially now by the Lisbon Treaty, later, to something totally different, and I call this a move from integration to unification. This was the beginning of the negative, wrong development, as I see it. SS: Just recently Germany’s vice-chancellor Sigmar Gabriel told Der Spiegel that the break up of the Union is a likely scenario - would you agree that the Union is in danger today? VK: First, I would be very glad if the European Union will transform itself into something else, so I wouldn’t call it a problem, I wouldn’t call it a danger, I would call it a chance, a potential victory for the future, but I’m really not so sure about it. Brexit was an important factor in this development, but I hope that Europe will finally start restructuring itself, transforming itself. And we, after the fall of Communism, we organized radical, dramatic transformation of the total system. I am absolutely sure that the EU needs something very similar to that. SS: You’ve criticised the EU many times over the lack of democracy saying that unelected bureaucrats are running the European Union - so how do you reform the Union while keeping the existing structure? VK: If I want to exaggerate, I’m supposed to speak next week in Austria, and I was asked to speak about how to make Europe better, and when I want to provoke a little bit I said: “There is a way how to make Europe - it’s getting rid of the EU.” So, if I want to be dramatic and radical, I think that the shell which is covering the European continent these days should be changed and I’m very much in favor of a much more free cooperation of individual member-countries, than have a Unified Europe. SS: But how can that happen while keeping the EU. If it’s decentralized, how would the Union exist? VK: This is not my problem, how the EU will exist. One thing is to have radical views, long-term views, another thing is what to do now, tomorrow, the day after tomorrow. I think the first decision should be to stop, stop absolutely, fully, any further so-called “deepening” of the EU, to stop accepting legislation coming from Brussels to the individual EU countries. So, that’s the first step, to stop the permanent process of intensifying these EU structures. The second dream would be to return back somewhere, and for me, of course, the optimal moment would be to return to the Maastricht treaty. That was the switch from the European Community - EC, to European Union - EU. That would be the long-term goal. SS: Well, the issue of sanctions is very close to us, to our hearts, and the common European foreign policy is being tested by the issue of anti-Russian sanctions - Italy, Slovakia, Hungary, your own country have voiced the desire to lift the sanctions. Can the EU really pursue its own foreign policy doctrine that would appease all its members? VK: I hope not, I hope not, and I consider the sanctions as an irrational move, which doesn’t help anyone: it doesn’t help Europe, it doesn’t help individual European countries, and, evidently, it doesn’t help Russia. So, I hope that with the coming of the new U.S. administration there may eventually be some movement in this respect. Europe is divided in this respect. VK: I know President Obama quite well. For many years I was the president of the country when he was in office, and so we had many chances to meet, and I have different views on many-many issues, but what he has been doing in the last couple of days, weeks, months - seems to me not a good heritage of his presidency, so I’m surprised at his current behavior. VK: I see it as a joke. I don’t take it seriously, and I’ve been participating in, I don’t know, ten, fifteen elections in the last 25 years, I can’t imagine to influence the elections from somewhere, from another country, and definitely not the people in the U.S. The normal, ordinary people simply wanted to change something and didn’t like Hillary Clinton and didn’t like the policy which she represented, so, I think that the election outcome - it was a rational and positive development. I don’t believe that any other country could influence the elections in America. SS: You have said many times that the U.S.-EU propaganda against Russia ‘is ridiculous’ - do you feel like their relationship towards Russia shaped by emotions, rather than facts? VK: First, I think that the greater role was played by the Americans, probably a bigger role than by the Europeans. Second, in Central and Eastern Europe, there’s a memory of the Communist era, definitely for many people. In my country, they really combine together Communism with Soviet Union - I always try to tell them there’s no Communism in Russia now, and there’s no Soviet Union, there’s Russia. I realized that this feeling, in Central and Eastern Europe, exists, definitely - especially in my country after the occupation of my country by the Warsaw Pact armies in 1968. This feeling is very strong. People like me, at that moment, got fired from our jobs. I was forced to leave the Academy of Sciences as a young, hopeful scientist, and so I spent 20 years in an irrelevant position. So, there may be a strong feeling against Russia in this part of the world, but I don’t understand these feelings in Western Europe, because they didn’t go through Communism. SS: President-elect Donald Trump has voiced a pretty simple message. He said that ‘a good relationship with Russia is a good thing, not a bad thing’ - so, if Washington reverses its policy towards Moscow, do you think EU will follow suit? VK: Hopefully, hopefully. This position of Trump is definitely rational, and I’m repeating, permanently, at home, that there’s no rationality in increasing the tensions between the superpowers. There’s no rationality in starting a new Cold War, and no one can win in this respect. So, I hope there will be a better future. SS: As of now, we have the biggest shipment of American tanks and troops that has arrived in Europe, ever since the Cold War. So, members of NATO are beefing up their defences in Eastern Europe - now all of this is obviously irritating Russia. So, anyone in their right mind knows that a real war with Russia is out of question - what is the point of all of this? Can there be an arms race? VK: The Western world is still not, probably, ready to accept the resurgence and the awakening of Russia. The Western world was quite happy with Russia in the 90s, weak and in a disarray, and not a strong partner. But, I’m sure that it’s quite rational to accept the realities of the world. Russia must do it as well. I don’t want to be one-sided in this respect. Russia must also try to find a rational way of dealing with its neighbors and with Europe and with America. SS:You know, as we go on we still try to understand why things happen, day by day. For instance, NATO has launched a missile defence system. It was aimed for your country, but now it’s going to be placed in Romania and later on set to be placed in Poland as well. This move sparks tensions with Russia, and obliges Russia to beef up its own defence. Why would Europe another source of tension with the Russians when relations are already so bad between Russia and Europe? VK: Those movements of armies and rockets is one thing, but I think that crucial area is the political climate. We can just hope that the new American administration will take a slightly different approach which would be for the better for all of us. SS: You think they’ll do it? Because, remember when Obama came, he actually scrapped the plans for missile defence, because he wanted to reset relations. Do you think Trump could do the same? VK: I don’t see into his head, but he made some strong statements and he’s not a standard, typical U.S. politician… Nevertheless, the strengths of the American political establishment will definitely have a much bigger role in his decision-making that is usually expected. SS: One thing is sure, that he has appointed businessmen in key positions in the White House. Do you think this business-like approach is a good thing for the world? VK: I am not able to be a businessman, therefore I had to be a politician. I’m joking sometimes! On the other hand, don’t demonize the businessmen - the businessmen are rational people, who, hopefully, may be able to do a rational policy. SS: When Donald Trump was elected, right, it was just another example of anti-establishment forces gaining ground in the West and the same thing we see in Europe, for instance in Germany we see AfD, Front National in France. Do you feel like it’s a temporary thing, or do you think that these new anti-establishment forces can really change the status quo in the EU? VK: This is my hope, because I consider the movements, anti-establishment movements in Europe - in France, in Germany, in Sweden, in Italy, in Netherlands, in some other countries as a potential for a change, really. I disagree with labeling those political parties as populist and ultra-right. No-no-no! They try to represent normal, ordinary people who simply want to change something in the country and who are very angry with the establishment, it’s arrogance in many of those countries. So, I hope this is a positive movement and how successful this movement will be is another issue. Nevertheless, I think it’s a long-term process, it’s a some sort of awakening of the silent majority in European countries. Something very important. SS: In the aftermath of the terrorist attack in Germany calls are growing louder for tightening border controls, integrating security structures - is a pan-European security union the logical next step for the EU? VK: Again, one has to start with discussing two main EU projects in the last decade - on one hand, the European Common Currency - Euro, and Schengen, the elimination of borders. I think that both are wrong and both were premature and both have been destabilizing Europe. I think, as someone who lived for half a century in Communism, definitely we wanted to live in a world with free borders, because the Iron Curtain was not a border in a normal sense. So, we wanted to live in a world with free borders, but it doesn’t mean that we wanted to live in a world without borders. Borders are absolutely necessary and it was, in my understanding, a tragic mistake to eliminate borders in Europe, and I would be quite happy to cross the border, showing my passport - that will not be my problem. VK: Definitely. This is… by the way, returning to one of my first sentences, this shift from integration to unification is the same problem. I would be happy with free borders, but without Schengen. SS: So, at the latest EU summit there was a lot of discussion about the possible creation of an EU army - you think that’s nonsense? VK: One thing is what I wish, another thing is what I can speculate about - I don’t know, but there’s not much interest in creating a European Army. This debate has been on for decades, but, practically, no one is seriously thinking about the European Army. I am afraid, that, of course, the elimination of borders was an intentional change for the future, to create a European Police, European security system, potential European Army - and that’s another reason why I’m so strongly against it. VK: I don’t have any other mind. SS: You don’t shy away, you always say what you think. Having said that, you’ve said that there’s a lack of freedom of speech in Europe. Why? Have you experienced it first-hand? Why would say something like that? VK: When you said that I’m not shy, I remember that there was a meeting of 20 presidents of Central, Eastern and Southern Europe, in Warsaw, many years ago in the moment of the Arab Spring. Obama was speaking there, I criticized him and he made a strong statement. He said: “President Klaus is not shy” - so it reminded me of this moment. But the question was about… free speech? SS: Have you experienced it firsthand? Why would you say that there’s no freedom of speech in Europe? VK: I don’t want to speak strongly about free and non-free speech, but there’s such a manipulation in the media due to the political correctness, that it’s very difficult to formulate strongly some views which don’t belong to the accepted conventional truths. There’s the problem, for many people there’s no chance to publish their views in normal media they have. They have to resort to some Internet servers, and so on. So, the freedom of speech has been limited in Europe, definitely, but I wouldn’t use the term “Free speech” or “non-free speech”. SS: The refugee crisis is obviously still at the top of the EU’s agenda today. The Czech republic, along with other Eastern European nations have refused an EU plan to redistribute refugees - why do you think that up to this day the EU hasn’t been able to come up with a coherent plan to deal with this problem? SS: Oh, I don’t blame the migrants either, they want a better life, but what about the Europeans who are suffering from the consequence? SS: So do you think they are the ones in favor of migrants? VK: No, no, this is not the way how to change the demographic, this is not the way how to increase the quality and quantity of labor force in Europe. I always rejected these arguments because there’s 10% of unemployment in Europe, something like 23 mn people, unemployed in Europe, in the EU - so, definitely, there’s enough people to work. So, the migration is not necessary for Europe. There’s an ideological motivation to bring new people, to create a new Europe. SS: Many people would agree that the only way to stop mass migration to Europe from those countries is to contain the conflicts in those countries. Do you feel like Europe should play an active role in Syria, in Libya? VK: First, we discussed whether Europe has a common foreign policy or not - so I’m not sure that Europe can be a real player, because there are so many different views in Europe, that Europe is not able to function as an entity, as a player in this situation. But about migration… I think there are many technical issues, but to stop migration, it’s sufficient to say “No”, and European Union is not ready to say that. That’s the main issue and main problem. 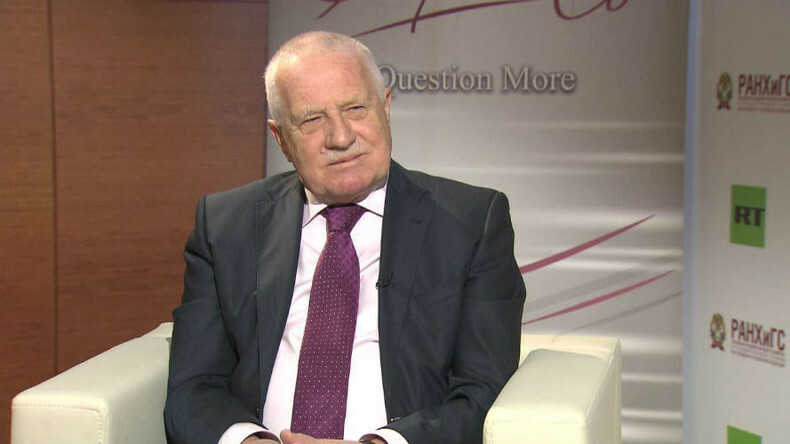 SS: Vaclav Klaus, former Czech President, thank you very much for this interview.